An unusual rabbit rescue has proved to be a lifesaver for little Lucky and her friends. Lucky, Holly and Po are 3 of 4 domesticated rabbits that it is suspected were dumped in the days before they were discovered hopping about the field of a small village school. Pupils, parents and teachers at Oughterside School, near Aspatria immediately called in officers from the RSPCA and launched the rescue mission. Together, they caught 3 of the 4 young rabbits and are still trying to entice the last one to take up the offer of a new warm home. 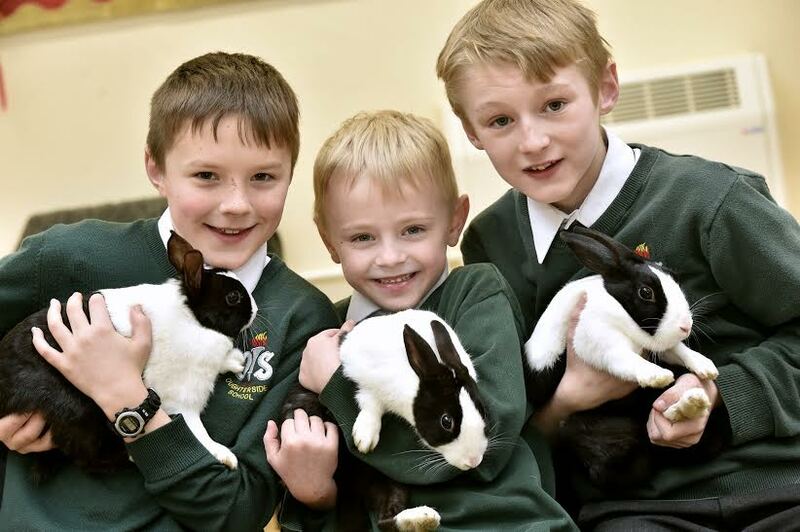 The three black & white bunnies, all female, have all been adopted by staff, parents or pupils. Teaching assistant Lynn Hall, who lives near Prospect gave a new home to a bunny her 10 year old son Josh has called Lucky. Teaching assistant Chelsea Buchanan has adopted Po, named after a character in the movie Kung Fu Panda. Meanwhile, parent Natasha Jones who has 3 pupils at the school, Tyler, Maizie and Harvey, has taken the 3rd one to their home in Aspatria. It was mentioned that someone was seen down at the beck at the bottom of the village, possibly dumping the bunnies, so it is likely it has taken a day or two for them to make their way up to the school. The rabbits appear to have been well looked after and are very healthy. The RSPCA officials were happy for the school to find the rabbits good homes, in fact they could have been re-homed several times over. There is also an adoptive family lined up for the remaining rabbit if it is able to be rescued.